On 21st July 2016, Epson Singapore made the official announcement of 7-a-side football tournament ‘Epson Singapore Cup 2016’ for youngsters. The tournament will be jointly organized by Epson Singapore and Sports management company SINAD Sports Pte Ltd.
Epson Singapore Cup 2016 tournament will have teams competing in U15 and U17 categories. The preliminary matches will be held on 3rd and 4th September and the final match will be held on 10th September. All the matches will be held at SAFRA Tampines. The U15 category winner team will be awarded with a 2 days training with the Valencia CF Football School in Singapore while the U17 category winner team will be awarded a 5 days training camp with the Matsumoto Yamaga FC from J2 League. 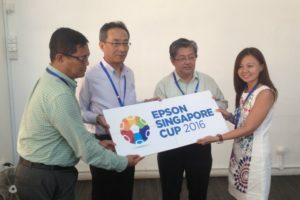 As Epson Singapore is the main sponsor for Geylang International FC (GIFC) of S.League, the players and coach of GIFC are planning to go to watch the tournament and support the participating teams by giving them advise from time to time. Only Singaporean citizens and PRs can participate in this tournament. The registration form for the tournament can be downloaded from the official website of the tournament. The participation fee is 350 S$ per team for U15 category and 500 S$ per team for U17 category. Deadline to submit the entries is 31st August 2016. F.LEAGUE goes to Asia! Bardral Urayasu Leads the Way! !